Ok, so lets take a trip down Memory Lane! Back to the 1970s. Its Saturday Morning and where are you? Well if you were a kid in those days..you were planted directly in front of the TV watching CARTOONS of course!! Yep, that was back when there was no “cartoon network” or dozens of other channels showing animated shows around the clock, 7 days a week. Back then, there were only 7 or 8 channels TOTAL available and the ONLY time to watch Daffy Duck and Bugs Bunny…was on Saturday mornings. I know it sounds weird in todays world, but thats how it was for kids in the 70s. Some of the best cartoons were seen for the first time in those days too. The Flintsones, Jetsons, Scooby Doo and Super Friends..just to name a few!! 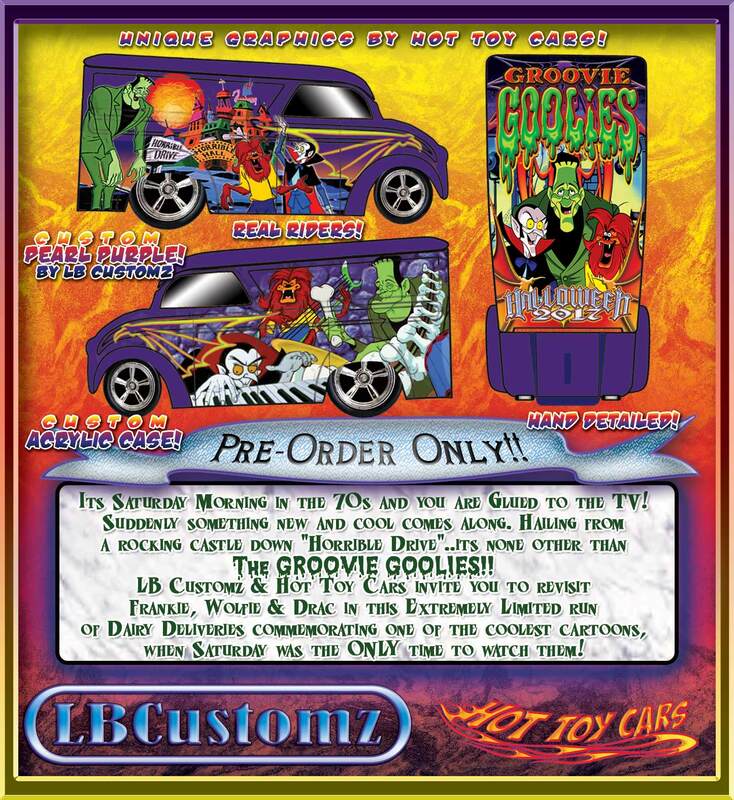 But one of the COOLEST cartoons to come along was a group of musical monsters called The GOOVIE GOOLIES!! Drac, Frankie and Wolfie rocked the place every week and made us laugh a lot too. 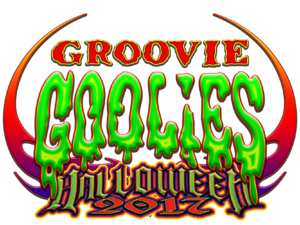 So to revisit those simpler times, we thought this Halloween would be a great time to commemorate those rockin Goolies! 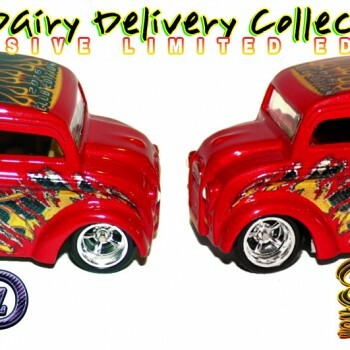 This called for another team up of world renown professional customizers to bring you this Original Art EXCLUSIVE Dairy Delivery Limited Edition!! 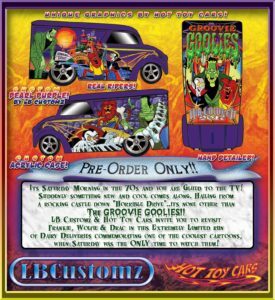 Features three fresh Groovie Goolies designs from Okie Logo (KB Kustoms official design company) and the masterful paint and assembly of LB Customs (Dino Laspada) who are both members of the Diecast Hall Of Fame btw!! A few select images were painstakingly restored and tweeked in many different ways, plus new and original elements added to create these three new and exclusive images of our friends down at “Horrible Hall”!! These unique designs were created using multiple “single” images of each character, that were meticulously restored prior to incorporating into the new scenes! Then serious manipulations to make them fit the scene and even newly drawn elements were placed into the scenes to give us a fresh, but cohesive look for all three designs. Each side is different, as well as the top image. But each gives us a glance back at these incredible characters from younger days.
. The Drivers side is a collage of the musical side of the Goolies! All seperate, restored images manipulated to appear as one scene. Frankie throwing down the beat..Drac tickling the keys, and of course, Wolfie wailing on his own style of guitar!! A stone wall background fades away into the Passion Pearl base color and a ghostly Bat wing graphic matches the other side! The top design depicts “our trio” with a background of movie lights, ready to film their next adventure! Original web and bat wing designs were created as well as a “Halloween 2017” logo to mark the occasion! The Groovie Goolies logo was totally recreated for this design and stretched a little here and there, plus some subtle legibility changes and lots of color!! Dino laid down a gorgeous PASSION PEARL purple for these goolish beauties!!! AND also adds his masterful details to the lights and grill. PASSION PEARL purple base color.